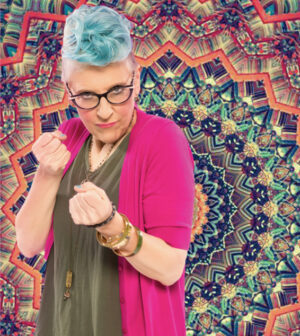 With a career that spanned more than 30 years, Lisa Lampanelli was a constant on the comedy scene. With numerous tours, Grammy nominations, and national TV guest appearances and specials under her belt, Lisa made headlines in 2012 when she lost more than 100 pounds with the help of bariatric surgery. The comedian went on to speak with unflinching honesty about her lifelong food and body-image issues, and has since gone from insulter to inspirer. I had the pleasure of talking with her about her new direction in life. Lisa will perform at the Ridgefield Playhouse on Thursday, April 11th. DH: Lisa, what inspired the transition in your career from stand-up comedy to storytelling and workshops? LL: I realized that what was missing in my life was having a way to be of service to people. When my father got sick and passed away, I had helped take care of him in hospice. My biggest dread my entire life was of my dad dying, but the good part of that happening was I had a role in helping him transition. After I went through this, I really felt there was this lack of service in my life, so I said to myself, “Okay, I can start to give back by just telling the story of my food and body-image struggles.” What happened was I enjoyed that more than stand-up comedy! I just kept listening to what my spirit felt had joy in it and was a service to people. It’s also expanded my career because it opened me up to people who didn’t appreciate insult comedy. This new style of storytelling is still connecting me with the audience and the audience with each other, but just in a different way. They get to hear stories that have a bigger point of self-love and self-acceptance, which still keeps them laughing and not taking themselves too seriously. DH: You speak about your struggles with weight and body image. How do you think this is helping people who have the same struggles? LL: In 2015, when I shot my fifth stand-up special, I noticed that my truthful stories about these issues resonated with my fans. Then when I wrote my play, “Stuffed,” which ran off-Broadway in 2016 and 2017. I went into it with the sole purpose of motivating fans to work on themselves and embrace a healthier life through self-love and self-acceptance. What also ended up happening is by seeing the fan reaction, I became inspired to retire from insult comedy and dedicate myself to helping others through storytelling events, workshops, and one-on-one coaching. I believe there’s a greater reason for why people struggle with certain things in life. You can’t hide who you are and you’re never “fixed.” There’s always work to be done on yourself. I know my work on myself will never end. DH: What advice would you give someone considering weight-loss surgery? LL: It’s a big decision. I chose to have weight-loss surgery to get me back to ground zero, so I could start from a place of acceptance while working on the emotional stuff that you have to work on or you’ll just gain the weight back. We have to realize that it’s never about the food. You’re not fat because you like food. French women love food and they aren’t fat. You have to get out of the way of this delusion. Don’t have surgery if you’re not willing to do the work about WHY you’re an emotional eater. If you’re not willing to go deep, you’re going to gain the weight back. It’s not worth the pain and drama of surgery if you don’t want to do the inside work. If you don’t like yourself and you are filling the hole with food, you will find a way to gain the weight back. DH: What is one of the biggest lessons you’ve learned from your struggles with weight loss and body image? LL: Great question! Being comfortable with the discomfort. Recently after a show, I found myself with three cookies in my hand. I was thinking, “Don’t I get a reward for making this event good?” I was looking for relief. 90% of my eating was always to stamp down some emotion. I actually have had a couple of clients who eat until they’re uncomfortable and feel literally stuffed. I had to ask them, “Why do you like that feeling?” There is definitely an emotional reason. One client told me that she felt like she was too much for people — too big, too loud, too boisterous — so she had to make the feeling inside match as punishment. DH: What can people expect from coming to your show at the Ridgefield Playhouse? LL: If you like to laugh, definitely come. If you like to hear true stories you’ll relate to, definitely come. If you want me to yell at you, just book me for life coaching instead.